The proximity of the busy commercial and fishing ports, adjacent to the marina, make compliance with the safety regulations imperative. Channel 12 must be monitored on any vessel in the channel equipped with a VHF radio; the vessel’s arrival must be transmitted to the harbour office on channel 9. Access to the port is controlled by a light signal at the end of the Pierre Lemaire Pier. When the signal consisting of 3 lights (green-white-green) is lit, only the vessel with authorization from the Harbour Master may enter the port. 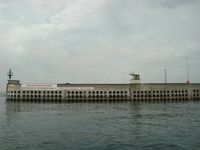 At the fishing dock outlet, further light signals regulate movement from the yacht marina and the fishing dock whenever a ferry or merchant ship is on the move. The three vertical red lights, when lit, indicate that no vessel is authorized to leave. 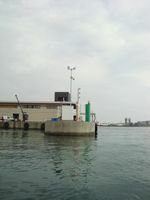 Port signals used to regulate traffic at the Port of Roscoff comply with international regulations. Yachtsmen must comply with commands given by the harbour officials.